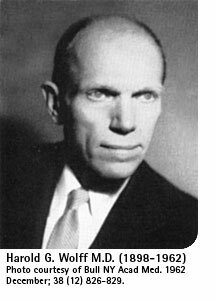 Dr. Harold G. Wolff performed the landmark work that determined what structures in the human body caused head pain back in the 1930’s and 1940’s. He took a series of 45 patients who required brain surgery and who could also cooperate with testing during the surgery and carefully recorded the patient’s responses to various manipulations during the surgery. His book Headache and Other Head Pain published in 1948 makes for fascinating reading on the early days of headache discovery. Wolff determined that inside the skull; veins and venous type structures on the surface of the brain, the cerebral arteries at the base of the brain, and the arteries of the covering the brain (dural arteries) were sensitive and caused pain when manipulated. However the lining of the brain (dura) and the brain itself was not particularly sensitive to manipulation. Outside the skull, Wolff also discovered that arterial manipulation produced pain in the temporal region and that constriction of extracranial arteries did not produce pain. He also found that if an extracranial artery was cut, then the artery downstream of the cut artery no longer produced pain. This implied that the pain transmitter was also traveling down the artery and was therefore severed when the artery was severed. Ultimately it was determined that branches of the Trigeminal Nerve running along the walls of the artery were cut.